As soon as the sun comes out and the temperature rises, my cravings for chips, guacamole and salsa begin. And don’t forget the beer or margaritas! I made homemade salsa for the first time a couple of years ago and I highly recommend that you give it a try! It’s super easy and the results are satisfying and delicious. I generally avoid raw onion as it can upset my stomach, but something magical happens when you combine it with cilantro, and I can eat tons of this salsa with no problems (as long as you don’t include onion breath as a problem). I adore homemade fruit salsas and have found that putting tomatoes in is not necessary at all. Experiment with different fruits and be creative. You might discover an amazing new flavour combination! I have made tomato salsa, mango salsa and peach salsa. The sweet fruits are my favourite, as their sweetness combines with the zing of the onions and the aromatics of the cilantro in a wonderful way. 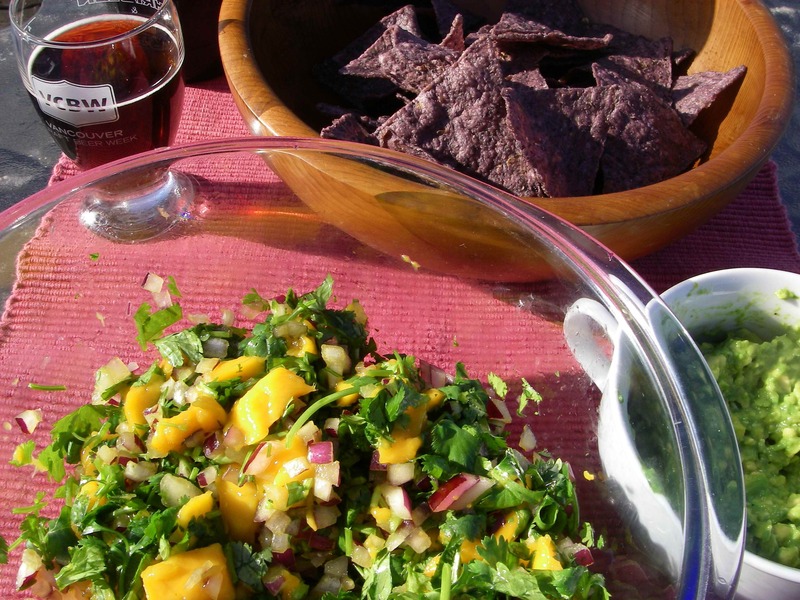 Mexican mangoes are available early in our summer season, but when the Okanagan peaches are in season whip up some refreshing peach salsa and get out in the sun asap. Blanch the peaches in boiling water (dunk for 40-60 seconds, then place in bowl of cold water). This loosens the skins, so you can easily peel them off by hand. Chop the peaches into fairly small chunks so they can be scooped up by a corn chip (I like it fairly chunky, myself). Add the chopped peaches to a bowl. Cut the mango on either side of the flat pit, then gently cutting a grid of small squares into each half by slices one way and then the other. Scoop the squares out into a bowl. Wash the cilantro and remove the excess water. Chop off and discard 2 inches of the stalks, then chop the remaining cilantro well and add to the bowl. Very finely chop half a red onion, add to the bowl and mix everything together. Salt to taste. I usually do several twists on my salt grinder. If you choose to, add 1 Tablespoon of fresh lime juice (about a quarter of a lime). The salsa also tastes great just straight up without it. Mix and serve immediately with Que Pasa blue corn chips and some guacamole (2 avocadoes mashed up until smooth with a pinch or two of salt, maybe a teeny squeeze of lime or lemon, but I prefer it just with salt). I find the salsa is best within a couple of hours of preparing since a lot of juice comes out of the peaches the longer it sits. If that happens, just drain some of the liquid off so people don’t get it all over their clothes when they bring a salsa-loaded chip to their mouths. Leftovers are nice added to an omelette or as a sauce for cooking fish or chicken in. Replace half or all of the peaches with fresh tomatoes (romas or whatever looks good at the farmer’s markets). Some salsa recipes tell you to seed the tomatoes, but I never do. Seems like a waste of time and produce to me. Fresh pineapple salsa is next on my list!